Walk into the newly opened Singapore Pinacotheque de Paris private museum housed atop Fort Canning Hill, and the first thing you will see is not a Rembrandt or Monet painting, but a host of sleek panels that flash and light up with information and digital images. Down a pristine, marbled corridor, schoolchildren eagerly tap and swipe away on an 8m-long interactive wall that calls up audio clips, pictures and factoids about the artists on display. Claude Monet, father of Impressionist painting, for example, lived in abject poverty almost all his life. “The aim is to present facts in bite-sized chunks. The wall is the first touchpoint for our visitors, so we don’t want to overload them. It’s an invitation to them to continue the journey through the museum,” says Pinacotheque’s chief executive Suguna Madhavan, who worked with a team of designers for 18 months to develop its Museum Of The Future concept. “We wanted to use technology as a platform to draw out the beauty of art, add layers of storytelling and provide a fun, immersive experience for our visitors,” she adds. The museum will soon roll out a mobile application that detects visitors’ locations using motion sensors and sends them information about the art they are viewing. In a social media era of left swipes, right clicks and ever-shortening attention spans, at least nine major museums and galleries here have turned to interactive technology such as touch screens and mobile apps to retain visitors and draw new ones, mirroring a trend in art capitals such as London and New York. This is accompanied by a gradual rise in the prevalence of digital art and mixed-media displays here. At the $21-million Indian Heritage Centre which opened last month, museum-goers can access roleplaying games and interactive screens. The centre, located at Campbell Lane in Little India, allows mobile phone users to scan QR codes for certain exhibits and further explore them. They may also borrow a handheld device and get a virtual guide to take them through the exhibition. “Technology allows our visitors to discover more about objects that pique their interest, gives them more information and makes the museum experience more immersive… it also makes the exhibits attractive and relevant to younger audiences,” says a spokesman for the National Heritage Board, which oversees the centre. Both the Asian Civilisations Museum and the National Museum of Singapore, which come under the heritage board’s purview and are now undergoing a revamp, will also deploy technology to augment gallery offerings. But their spokesman declined to give details, saying that these are “still very much in the works”. Next month, the National Gallery of Singapore plans to introduce a mobile application developed by tech firm Accenture, to guide visitors through its collection of 19th- and 20th-century South-east Asian art. This is ahead of the museum’s opening in October on the site of the City Hall and former Supreme Court. Accenture will also mine data gathered through the app for insights on visitor patterns and preferences. And it is not only art museums that are getting in on the act. Visitors at the Lee Kong Chian Natural History Museum, which opened in April at the National University of Singapore, can access video clips via interactive touch screens and download a mobile app to learn more about dinosaur bones. 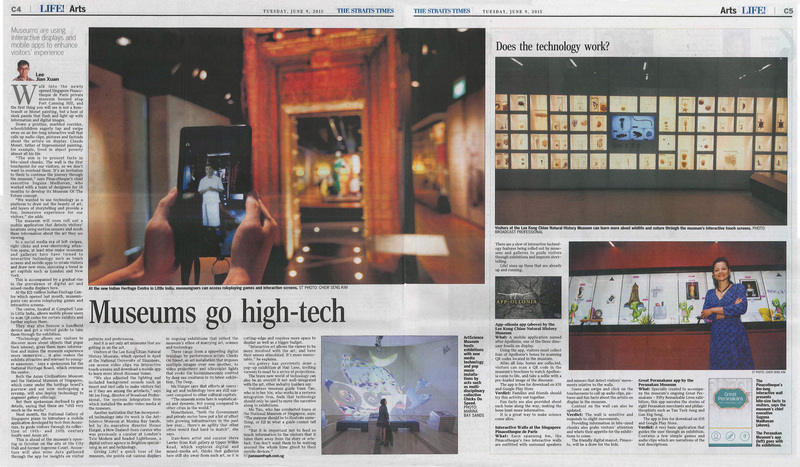 “We also adjusted the lighting and included background sounds such as insect and bird calls to make visitors feel as if they are among the artefacts,” says Mr Joe Fong, director of Broadcast Professional, the systems integration firm which installed the audio-video media at the museum. Another institution that has incorporated technology into its work is the ArtScience Museum at Marina Bay Sands, led by its executive director Honor Harger, a New Zealand-born curator who was a curator at London’s Tate Modern and headed Lighthouse, a digital culture agency in Brighton specialising in art and technology. Giving Life! a quick tour of the museum, she points out various displays in ongoing exhibitions that reflect the museum’s ethos of marrying art, science and technology. These range from a sprawling digital bricolage by performance artists Chicks On Speed, an art installation that imposes multiple images over one another, to video projections and ultraviolet lights that evoke the bioluminescence emitted by deep sea creatures in its latest exhibition, The Deep. Ms Harger says that efforts at marrying art and technology here are still nascent compared to other cultural capitals. Nonetheless, “both the Government and private sector have put a lot of effort into growing infrastructure in the past few years… there’s an agility that other cities would find hard to match”, she says. Iran-born artist and curator Steve Lawler from Kult gallery at Upper Wilkie Road, which explores digital and mixed-media art, thinks that galleries here still shy away from such art as it is cutting-edge and requires more space to display as well as a bigger budget. “Interactive art allows the viewer to be more involved with the art and have their senses stimulated. It’s more memorable,” he explains. His gallery has previously done a pop-up exhibition at Haji Lane, inviting viewers to react to a series of projections. The brave new world of technology can also be an overkill if not well-integrated with the art, other industry insiders say. Volunteer museum guide Yuen Tan, who is in her 30s and who works in a systems integration firm, feels that technology should be used only to move the narrative along in exhibitions. Ms Tan, who has conducted tours at the National Museum of Singapore, says: “The purpose should be to illustrate something or fill in what a guide cannot tell you. There are a slew of interactive technology features being rolled out by museums and galleries to guide visitors through exhibitions and improve storytelling. Life! sizes up three that are already up and running. What: A mobile application named after Apollonia, one of the three dinosaur fossils on display. Using the app, visitors must collect four of Apollonia’s bones by scanning QR codes located in the museum. After all four bones are collected, visitors can scan a QR code in the museum’s brochure to watch Apollonia come to life, and take a selfie with a pre-loaded image of the dinosaur. Verdict: Families and friends should try out this activity together. Fun facts are also provided about each bone along the way, making the bone hunt more informative. It is a great way to make science come alive. What: Each spanning 8m, the Pinacotheque’s two interactive walls are outfitted with surround speakers and sensors that detect visitors’ movements relative to the walls. Users can swipe and click on the touchscreens to call up audio clips, pictures and fun facts about the artists on display in the museum. Content on the wall can also be updated. Verdict: The wall is sensitive and responds to slight movements. Providing information in bite-sized chunks also grabs visitors’ attention and whets their appetite for the exhibitions to come. The friendly digital mascot, Pinacoto, will be a draw for the kids. What: Specially created to accompany the museum’s ongoing Great Peranakans – Fifty Remarkable Lives exhibition, this app narrates the stories of eight Peranakan merchants and philanthrophists such as Tan Tock Seng and Gan Eng Seng. The app is free for download on iOS and GooglePlay Store. Verdict: A very basic application that guides the user through an exhibition. Contains a few simple games and audio clips which are narrations of the text descriptions.